Snyder’s Gluten-Free Mini Pretzels: Review, Ideas and Giveaway! Way back before I went gluten-free almost 5 years ago, my husband and I used to be huge Snyder’s of Hanover (regular) pretzel fans. I remember eating Snyder’s pretzels when we started dating in 1989! Our favorite snacks were their sourdough hard pretzels, pretzel rods and sourdough nibblers. Once I went gluten-free I thought I would never enjoy another Snyder’s pretzel again — that is, until the day I discovered their Gluten-Free Pretzel Sticks back in 2010. Ever since, our family has been their #1 group of fans — I’m the kind of #1 fan (in my own mind) of their pretzels that I feel like I’m almost a stalker or something. 😉 I honestly think that we’ve gone through one bag almost every week since we first found them at our local Wegman’s store. Even my dog begs for them and my non-gluten-free husband loves them! We bring them everywhere as snacks, and just really appreciate and enjoy their taste, texture and lack of weird after-taste (that you get with other brands of gluten-free pretzels). So you can imagine how excited I was to find out that my favorite pretzel company just came out with a new shape…Snyder’s Gluten Free Mini Pretzels. My daughters and I couldn’t open our first bag fast enough. We almost ate the whole thing that same afternoon, eating them both plain and dipped into hummus. For all of the above, we preheated the oven to 400 degrees, arranged pretzels and placed colored melting disks or chocolate disks with nonpariels (round sprinkles) on top. Melt them in oven for 30-60 seconds and place in freezer to harden. The buttons only take about 30 seconds but the others take around 60 seconds to melt enough. Because ovens differ, I would suggest you do a little trial and error until you’re able to get them to melt enough to stick onto the pretzels so they don’t fall apart. I brought a big tray of these to my grandma’s 90th birthday party yesterday and they all disappeared without anyone realizing they were g-free! I ask you: Who better than Snyder’s to make our favorite g-free pretzels? (Now in 2 different shapes!) Which other company makes gluten-free pretzels right here in the good ol’ U. S. of A? None that I know of — other brands are imported. The fact that they are Certified Gluten Free (with that sight-for-sore-eyes logo printed right on the bags) is a huge plus, too, and I commend them on making the effort. Also Certified Gluten-Free are their Multigrain Tortilla Chips in their EatSmart Naturals line. And they also offer 100 Calorie Pretzel Stick Packs now, too. Next I am pulling for them to make gluten-free pretzel rods! This entry was posted in fun for kids, giveaways, kids in the kitchen, reviews, supporters and tagged fun ideas, giveaway, gluten sensitivity, gluten-free kid, kids, kids helping, kitchen, pretzels, recipes, school parties, supporter, treats by kachalmers2. Bookmark the permalink. Such creative ideas! We made chocolate-dipped and holiday-sprinkle covered pretzels as one of our Christmas treats this year. It was a great project for my six-year-old daughter to participate in and they were loved by all gluten-free and non-gluten-free family members alike! They’re now a favorite in our house for any holiday (along with chocolate-dipped and sprinkled marshmallows) – I need to go find some St. Patrick’s day sprinkles!! 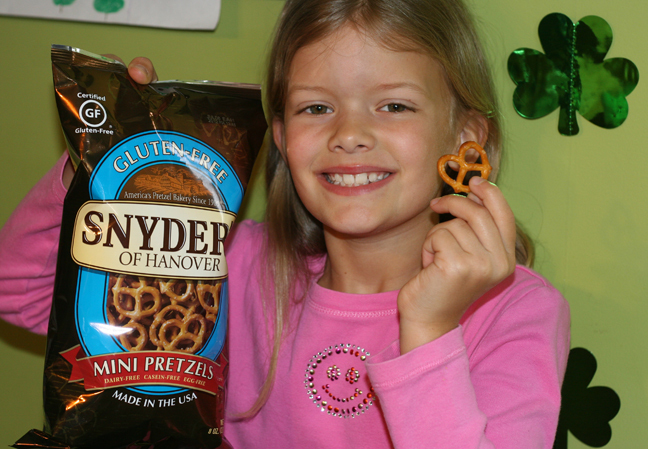 We have not had Snyder’s gluten-free pretzels, but we would love to try them – maybe in time for Easter?! We just started our gf adventure in January. She was so excited when when we found the gf pretzels. Pretzels were a go to after school snack for her. When we first tasted them, she thought they were going to taste funny but in fact they taste better than regular pretzels. They are light and tast like a sour dough to us. We love to put them in our chex mix and cover them with chocolate. I hope our store starts to carry the gf pretzels more. We have only been able to find the gf pretzels at one store in Topeka, KS. I am going to ask the manager to order the mini pretzels so that we can make the shamrock pretzel treats for her class. They will never know the difference. Plain, or dipped in a bit of guac!!! They probably wont last long enough for much more! We love pretzels sandwiches, which are basically one pretzel in the oven set really low (225 I think) and put a hershey’s kiss or hug on it. and 4-5 minutes later pull them out and squish another pretzel on top. Some hershey’s ones dont work well, such as the caramel filled ones. But these are yummy and easy to make. me and my Grandkids are planning on making decorations with them for Easter If we don’t eat them all first! What great ideas! I’d love to use the G-free Snyder minis for these perfect and cute little treats! I would like to make chocolate dipped pretzels for my gf kids, and also to just have them to pack into lunches, great go to snack! These treats look so fun to make! We are going to try the shamrock ones! This is so exciting! We live in Missouri and have yet to see the minis or the 100 calorie pack!! We absolutely love the sticks!!! My daughter (age 5) is most looking forward to trying the minis to make the M&M buttons or dipping them in melted chocolate and then covering them with sprinkles!! We have tried this several times with another brand, but the top layer of the pretzel always gets mushy!! Soooo excited!! We love Snyder’s! Thanks for the giveaway! I had no idea synders pretzels are gluten free. I’m going to have to go get some right away, my little guy will be so happy. I think I will get some white chocolate and make some flowers and butterflies. Btw made your monster cookies yesterday. Delicious! Look forward to your updates! Thank u so much. These new Snyder’s gluten-free pretzels are awesome. I love Snyder’s of Hanover pretzels. I haven’t tried any I don’t love. I eat them plain..no dip, no toppings, just perfect plain. Oh, how I was we could buy these in Canada! $9 for a bag of Glutino pretzels is a bit expensive!! I would love to try the Shamrocks, they are super cute! Dipped in chocolate is what we love at our house. Or just straight from the bag! We love anything pretzel! WOW! I loved hearing that Snyder has now made gluten-free pretzles. I will be looking at my grocery store! 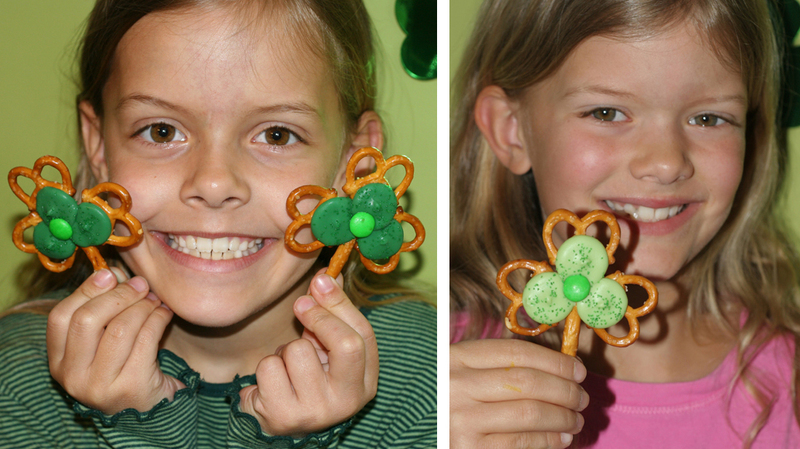 I can’t wait to make the sweet and salty shamrock pretzles with our cub scouts for our St. Patrick’s Day den meeting. This will be a great activity. They are going to love them! I always make trail mix for our camping trips and will definitely be using the gluten-free pretzles in the mix. Thank you for sharing these great ideas. We are defintely going to try out the pretzel dragonflies!! How cute and they look so yummy! My son and I would love to eat pretzels plain or in a trail mix. My grand-daughter started kindergarten this year, and I was concerned about her not eating enough being in school all day….but they can take snacks and the teacher is very lenient letting them snack when they’re hungry! She loves pretzels and I’m looking forward to letting her take a bag of these for school!! We are going to try the Shamrock food craft if we can find the mini pretzels at the store. My Wegmans had the sticks but I haven’t seen the minis yet. We love the sticks so I bet the minis are just as good. My husband (a non-celiac) likes them better than regular pretzela and they’re rasonably priced too! About a month ago, my son said “I like these pretzels (Snyders) but I really wish they made the regular shape. I miss those.”. Low and behold, you posted a picture of them!! I have been looking all over Michigan ever since. We like our pretzels dipped in hummus, nutella..added to Chex mix or treats similar to yours above. We might try making Bunny Bait (found on Pinterest) next month. Thanks for the opportunity! I would love to eat these pretzels as a snack with some mustard! I would love to try these, I used to love snyders before the diagnosis! My son and I would love to dip them in peanut butter or hummus! My son LOVES pretzels but the only GF ones we’ve seen around here are Glutino (delicious but quite expensive). Would love to give him a pretzel snack! He likes them plain or dipped in peanut butter. A.C. Moore has the Make ‘n Mold candy disks on sale for $1.79/bag this week. Yay! Gonna get some and try to make some of these cute snack ideas. I am not very crafty but these sound easy enough. Excited to try! Yes! So excited to see this – My girls and I will be dipping them in Rasberry Honey Mustard…right out of the jar! I will be watching for these – and put in a vote for them to replicate their peanut butter pretzel sandwiches in a GF version! I am a long-distance runner, and those little PB sandwiches used to be (pre-celiac diagnosis) one way to get some carbs, some salt and a bit of protein in a fun, easy to eat form for my long runs. OMG! We are HUGE Snyders fans! I had NO IDEA they made these. My son would devour these. He has Aspergers and 5 food allergies to include (wheat). He wont eat the other brands of GF pretzels. So that is my answer. He would eat them, probably everyday at lunch! I’m so excited!! My hubby and I also devoured them when we were dating! He loved the Buffalo flavor and I loved the honey mustard! My hubby will probably try to recreate the Buffalo flavor. I’ll dip them in dark chocolate or make s’mores. I can’t wait to go shop for them! I was just diagnosed and just getting used to the diet change so I have a lot to learn and experiment. I’d love to dip them in Sunbutter! I didn’t know Snyders made GF pretzels! YAY! I’m going to ask my store to carry them and the first thing I will do is dip them in hummus. Then put Laughing Cow cheese on them. then make cute little flowers like you did! Although we still hope to win the giveaway…we couldn’t wait…we went to our local Fairway and got a bag of Snyder’s GF Pretzels and off they went to my son’s school (they keep them there for snack time)! He was sooooooo excited!! 8 year old daughter’s birthday party is in a couple weeks and these would be great in a bowl by the self but I think we will make some treats with chocolate. Salty and sweet can’t be beat. What a great giveaway! My son is newly Gfcf and this would be the perfect snack for him! He’d love to have great tasting pretzels to dip into penny peanut butter! 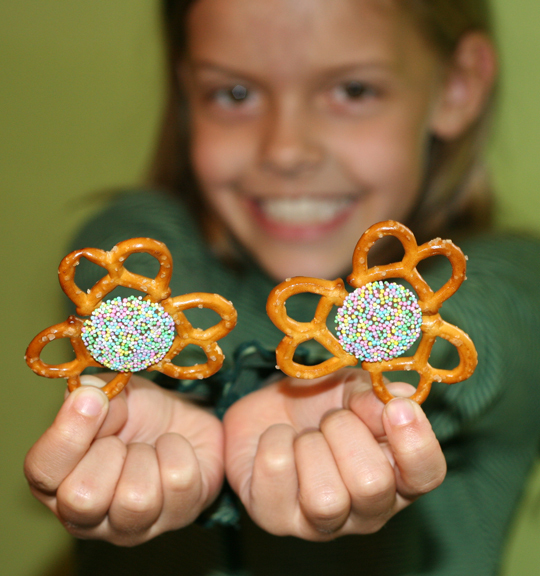 Love to dip in chocolate, my daughter and I are gfcf and love pretzles! We always get way too much chocolate in our Easter baskets, so we melt the chocolate bunnies down and dip the pretzels; then we refrigerate until the chocolate re-hardens. Love the crunchier texture of Snyder’s GF pretzels compared to other brands and they work so much better for our Easter chocolate melting tradition! Have not seen the twists in our town yet, but looking forward to them! 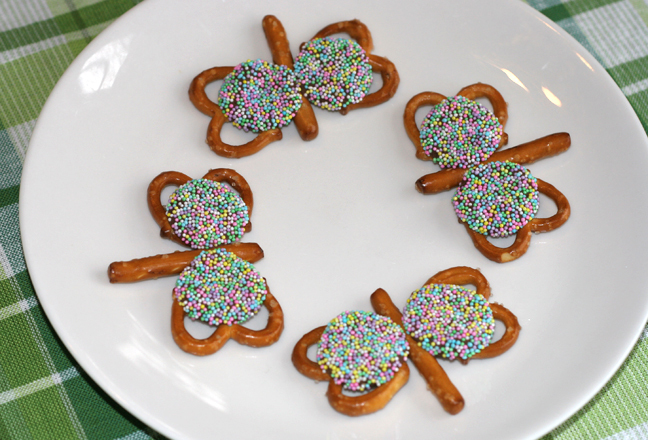 We would love to have the pretzels to make some gluten-free treats for Easter. Maybe a rabbit themed trail mix! Love these ideas! Hope to find these in a store near me soon! I’ve been buying Glutino’s only occasionally because they are so expensive. So excited to find the Snyders! I would love to make the festive shamrocks this week. 🙂 They would be good dipped in peanut butter or Nutella. Those ‘butterflies” are so adorable !! Love the sticks, cant wait to try theses! We eat em plain, dipped in hummus, mustard and with cubes of cheese! can’t find any Snyder’s GF products within a 50 mile radius of my house 😦 Hope they widen their distribution of them soon! A huge thank you goes out to Snyder’s of Hanover for the 10 bags of mini pretzels they’re giving away as prizes, and for making such delicious, affordable gluten-free pretzels. (Along with a plea to make the first ever GF pretzel rods next) 🙂 Who else could do it better than Snyder’s?! The 10 randomly drawn winners have been emailed. Winners this time are: (1) Shannon (2) Diane Gallegos (3) Amy Berg (4) Stefanie (5) Jane Broyles (6) Lesli (7) Kimberly Russo (8) Emily Hanson (9) Rachel Blom (10) kelli. If I don’t hear back from any of them by midnight on Wed. March 14th, I’ll have to draw new names to replace them, and will notify any new winners by email.